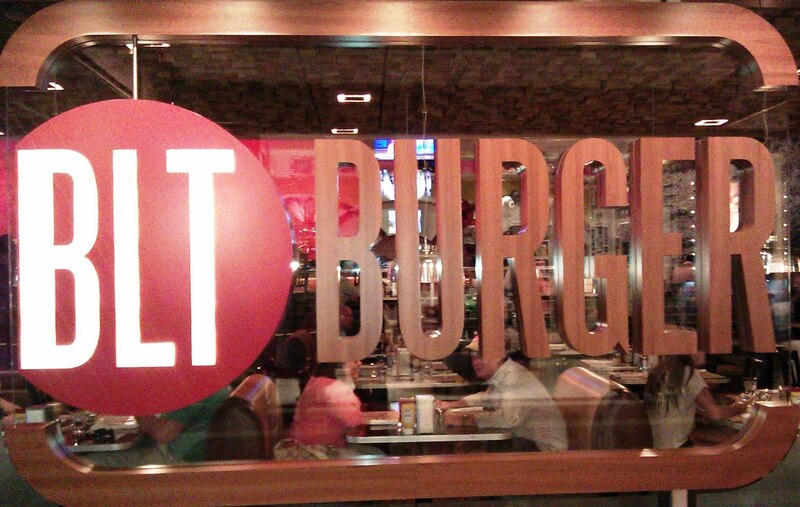 BLT Burgers (Bistro Laurent Tournodel) was my 7th stop on the Las Vegas Tour. This was one of the high-end burger joints that started it all. Hubert Keller's Burger Bar at Mandalay Bay was the other old-timer that I had enjoyed in years past. Burger Bar was quickly outpaced and outclassed once the burger movement gained momentum. I wondered if BLT Burger had also been left in the dust. BLT Burger was already half full of diners when I arrived on a Thursday a little before noon. I met up with Assistant Manager, Michael Smalley. Mr. Smalley's knowledge of the cuisine and its preparation was nearly encyclopaedic. I had almost no unanswered questions by the time the chef arrived. Michael had been with BLT Burger for about a year. His professionalism and gracious attitude were most welcoming. Executive Chef, Juan Zuniga was kind enough to take some time to speak with me. He was educated at The Art Institute of Santa Monica, and he had earned his chops at various private country clubs in Southern California. I ordered the lead item off of the menu of 8 burgers and assorted sandwiches. It was The Classic, a 12 dollar, 7 ounce burger. Cheese was $1 extra. 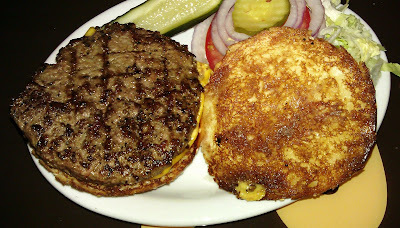 There was both a grill and a griddle at BLT, and some patties were grilled and some were griddled. I wanted a griddled sear, so I asked Mr. Smalley if it was uncommon for the kitchen to receive a request for the beef burger patty to be griddled rather than grilled. He indicated the this was a relatively common request. 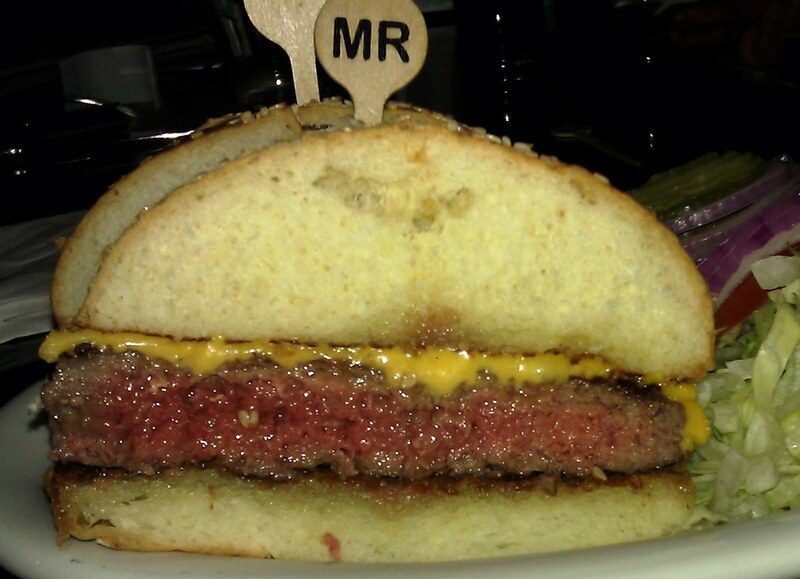 Also, I asked that the burger be cooked to Med-Rare rather than the house-standard of Medium. 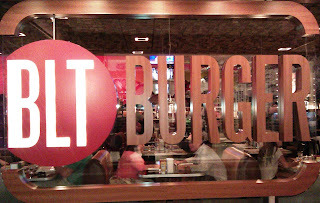 BLT Burgers certainly held to the "Bistro" part of the name, and my burger arrived in about 5 minutes. The Beef: A unbelievable amount of work and care went into the beef at BLT Burgers. The BLT Burger butcher had a shop on The Mirage property. The butcher took regular delivery of beef and broke it down for grinding. The blend was relatively equal parts Sirloin, Short Rib, Chuck, and Brisket. The beef was all CAB (Certified Angus Beef), and it was not aged. The burger meat was twice ground but ground coarsely. This served to both tenderize and blend the various cuts of beef. The beef was ground daily and formed into patties by the butcher--900-1,200/day--and brought over to BLT Burgers each morning. That was a lot of attention to detail and quality. This attention to detail and quality came through in every aspect of the bite. The beef was an exercise in nuance and restraint. The various cuts of the beef contributed flavor, richness, and texture, while no single element dominated. The beef was flavorful, juicy, mild, complex, buttery, and hearty. It was all of these things and all at once. 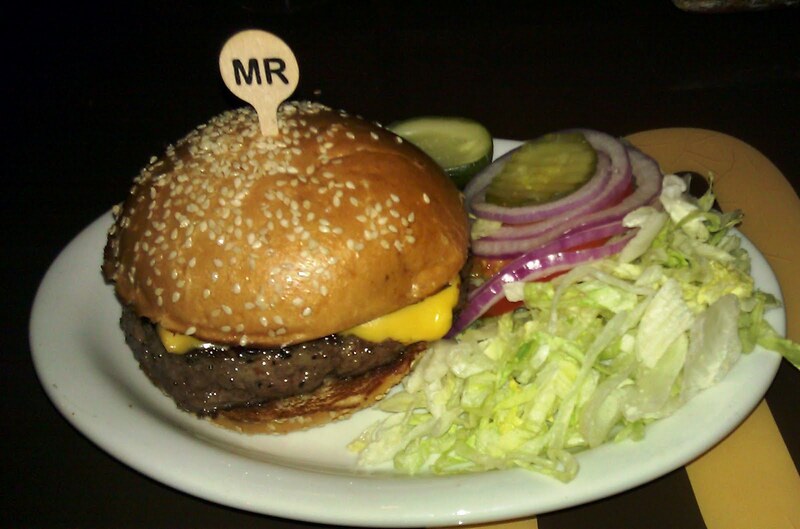 The beef was completely satisfying, and I could not stop picking at the beef in the other half of my burger. I was careful to only eat 1/2 burgers during my siege of 8 burgers in 3 days, but BLT Burger was beyond my ability to resist. The Seasoning: The blend was unseasoned. The burgers were brushed with butter while cooking and dusted with the appropriate amount of salt and pepper to enhance the flavors of the beef without overwhelming them. The Sear: My burger was both grilled and griddled. Since the 7 ounce patty was relatively flat, and I had requested that it be cooked to Med-Rare, the sear was about average. It was neither disappointing nor impressive. It was adequate to concentrate the seasonings and juices, while providing some texture to the bite. The cooked layer of beef was thin in comparison to the depth of the patty, and that suggested a very hot cooking surface. The Preparation: The kitchen nailed my Med-Rare request. The preparation of the burgers at BLT Burgers was simply flawless in every aspect. This was a well-oiled machine, which had been operating for years. While I met with Executive Chef, Juan Zuniga, it was Sous Chef, Wendy Porche that was heading up the kitchen while my meal was being prepared. Credit goes to Chef Zuniga for a kitchen that turned out such a high-quality product. The Cheese: I chose American cheese from the list of 5 cheeses on the menu. The American cheese was properly melted, and it contributed all of the usual comforting goodness in terms of texture and flavor. It really is hard to go wrong with American cheese. The Bun: The seeded, brioche-style bun came from Granello Bakery in Las Vegas, and it was delivered fresh each morning. The bun carried almost no sweetness. This bun was all yeasty and savory notes. The texture was supple, moist, toothsome, and tender. The bun was thoroughly buttered and toasted The toasting was accomplished using a commercial, conveyor toasting machine. The beef was so juicy that the bun did not contribute crunch, but it did hold together, so fingers remained dry. The Fries: The potato wedges, the thin fries, the waffle fries, and the sweet potato fries were all prepared and delivered frozen by Lamb Wesson. All of these were superbly cooked in a canola/soy blend and perfectly seasoned. WAIT! 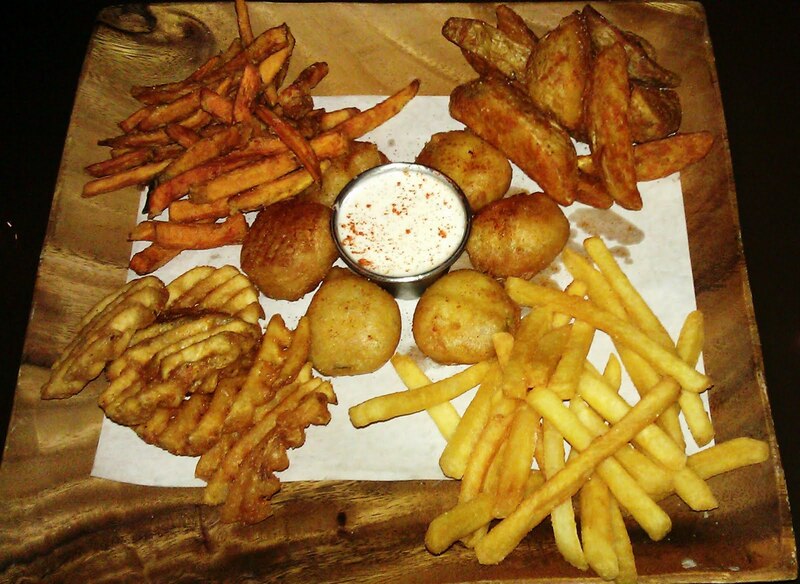 The beer-battered, deep-fried, pickle slices were made in-house, and these were spectacular. I mean, they were share with strangers just to see their faces light up, spectacular. 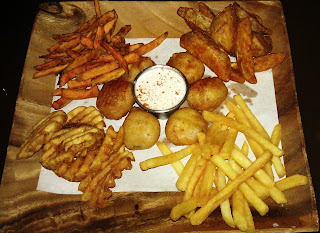 These were a real standout, and I would forgo the fries at BLT Burgers for those crisp, sour, doughy delights any day. The Toppings: The tomato slice was fresh and delicious. The shredded Iceberg lettuce actually made sense with this burger. This was mild in both flavor and texture so it would not compete with the carefully balanced beef. The burger also came with a sour pickle. This was a half-brined pickle spear, which still retained most of its raw cucumber flavors. It matched the burger perfectly. The Shakes: BLT Burger had an extensive shake menu--9 regular and 5 spiked. The kitchen sent out a flight of small shakes. Pictures below from left to right. Mocha Mudslide: This was a cold, creamy Oreo cookie in the form of a milkshake. Campfire Marshmallow: This was made with toasted marshmallows, and the texture was wonderful. Berry Me: This one was popping with fresh berry flavors, and it was my favorite of the group. The Value: With cheese, The Classic Burger at BLT Burgers was $13, and this was a reasonable price to pay for something so well-crafted, intentional, and decadent. BLT Burgers delivered a burger, which was a study in restraint, nuance, and subtlety. Previously, I might have dismissed this burger, because it lacked a "wow factor", but the beef in this burger was exquisite in its complex interplay of flavor and texture. It was the Professor X of burgers in a town full of Wolverines. Keep in mind that BLT Burgers had to walk a fine line. The clientele at The Mirage was largely Mid-Western, so this French-influenced burger was tailored to satisfy those tastes while remaining true to its disciplined roots. This burger and the fried pickles were good enough that I ate more than I should have, and I blew off my final review of the trip. Sorry Postrio, BLT Burger was too good to put down. Burger Review : BLT Burgers has stood the test of time. I strongly recommend this burger.